Deadline to apply for Spring 2019 graduation is Tuesday February 5, 2019. This graduation application is required for us to process your degree completion and order your diploma; it is not for the graduation (commencement) ceremony. 4. On your Student Center Page, under the Academics Section, click on “other academic” drop down listing. 5. Select “Apply for Graduation” and then click on the arrow. 6. Follow the instructions to complete the online graduation process. 7. A confirmation page will appear following the submission of your application. An email will be sent to your UWM email address. !! 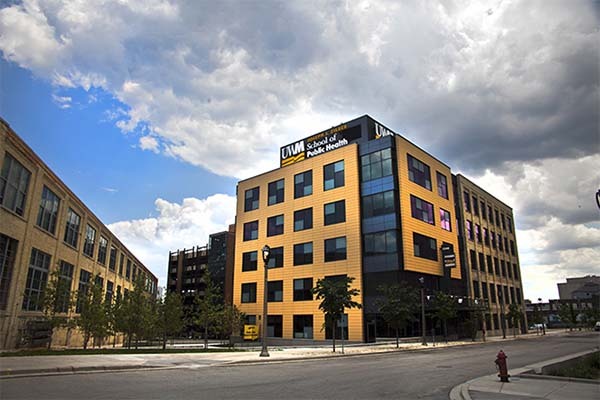 !UWM – Graduate Student Services Associate!!! • Answering phone calls and e-mails for both students and applicants at the Graduate School front desk. Nicole Solakiewicz, Graduate Student Services Coordinator, at solakie2@uwm.edu. This Research Assistant will be responsible for assisting with a variety of tasks for a research program focused on studying lifecourse social and nutrition‐related factors and breast cancer risk primarily among participants in the Young Womens Health History Study (YWHHS) at the University of Wisconsin Milwaukee and the Medical college of Wisconsin. The position will provide support to the team that will include data cleaning, data analyses, literature review work, grant submissions, and other general research activities, as needed. Please send: I) a cover letter describing interest and qualifications for position, (II) a resume/CV, (III) a transcript (unofficial is fine) of public health‐related graduate coursework through December 2018, and (IV) names and contact information for 2 references (with at least one being a graduate school course instructor). Please email these materials to Dr. Ellen Velie at velie@uwm.edu, by January 25, 2019 at 12pm. NOTE: A formal institutional application will also be required at a later date. Foxconn is seeking a Public Health Communications Specialist who enjoys the challenge of performing in a start-up environment and has a desire to revolutionize a whole new industry. The Public Health Communications Specialist will build a legacy, and have a direct impact on the current and future state of Foxconn’s culture. The Administrative Program Specialist (Grants Administrator) is responsible for performing pre- and post-award grants management and reports directly to the Director, Shared Office for Administration of Research (SOAR). This position will be supervised by the Director of SOAR but will be overseen by Associate Deans in Joseph J. Zilber School of Public, College of Health Sciences, Helen Bader School of Social Welfare and College of Nursing. The Grants Administrator (GA) will take the lead in all pre-award administrative aspects of the research application and will manage the post-award administration for sponsored programs for grants within their specified portfolio. The GA will serve as a liaison among principal investigators (PI’s), university administrative units, sponsors, and departments/deans on proposal development and submission and award review, set-up and financial management. The Coordinated Entry Prevention Navigator works closely with the 2-1-1 Community Resource Specialists, the Coordinated Entry Team, and community partners to provide in-person assessment, resource development, and short-term case management to individuals at high risk of homelessness. The goal of this intervention is to divert or prevent people from becoming literally homeless, and when that is unavoidable, to work with the Coordinated Entry System to facilitate connection to emergency and permanent housing solutions. The Coordinated Entry Prevention Navigator will provide quality professional services to internal and external customers and implement IMPACT’s philosophy of teamwork, customer service, and value added, in the call center and in the community. The HEP Communications Coordinator will provide editorial leadership, guidance, coordination, and strategy for the HEP section. This position has primary responsibility for developing and finalizing communications materials, including presentations, newsletters, webpages, and internal and external reports. The position will also provide formatting and editorial support for other section products such as after action reports, grant applications, and progress reports. The position will work with a diverse set of internal and external partners including DHS emergency response coordinators from other divisions, staff from Wisconsin Emergency Management, coordinators of the regional healthcare emergency readiness coalitions and contacts at local public health agencies. The coordinator will be responsible for working with HEP staff to develop roll out plans to communicate new products or initiatives to partners, stakeholders, and the public. The position will be expected to work collaboratively with the office toward identified strategic goals. In emergency events that have a public health or healthcare impact, the position will provide support and may serve in an incident response capacity as part of an incident management team. The HEP Communications Coordinator will be expected to serve on Division of Public Health committees as requested. Read the full e-newsletter here.